Who is Brian Lapointe ? More than a holiday problem. Growing up by the sea, I am used to find Sargassum floating in the water or washed up on the beach. We have always seen Sargassum and other seaweeds and plants which presence is normal in the marine and coastal environment. However, the quantity of Sargassum that has arrived through the Great Caribbean region since 2014 is unprecedented, as well as the consequences. That’s why there are studies being conducted to understand what this phenomenon is and how to deal with it, not an easy task. I had the opportunity of listening to a senior researcher of UNAM (Mexico’s National Autonomous University) and expert in seagrasses and tropical marine vegetation, she works at the Tropical Seagrass Systems Laboratory in Puerto Morelos. Many of the questions I had were answered during her talk at a local Planetarium. I am hereby sharing them with you. I have recently learned that the Sargassum arrival has completely changed the dynamic of some very important coastal environments in our region and we all need to take a better look at the issue if we want to continue enjoying our beaches and reef in the future. The problem is not only how tourists perceive the beach and where we are putting the sargassum after it’s collected. I used to think that Sargassum affected the tourism industry because visitors have high expectations and find it hard to enjoy the beach full with this brown colored alga. I have recently learned that the problem is way more worrying than the holidaymakers and a 10 day vacation in the Caribbean. We are not talking about the way the beach looks anymore, we are talking about an environmental issue that is not about to be solved any time soon. Sargassum might be a problem that our grandchildren (which aren’t born yet) will have to fix. If you want to learn more, keep reading. Sargassum might be a problem that our grandchildren (which aren’t born yet) will have to fix. Sargassum is an alga that lives most of its lifecycle floating on the surface of the ocean. Sargassum does not originate on the bottom like other kinds of algae, it reproduces and grows while drifting with the currents and floats in the water column until it reaches the coast where, usually, exits with the movement of the water (waves and currents) onto the sand. It then dries, decomposes or simply goes back to the water and continue on floating. We have two types of Sargassum in the Caribbean: Sargassum natans and Sargassum fluitans. Both species look almost exactly the same to the untrained eye. Sargassum and seagrasses are NOT the same thing, they are totally different kinds of living organisms. Seagrasses are plants with seeds, flowers and fruits (yes, underwater flowers AND fruits! While Sargassum is an alga. In the open ocean, islands of Sargassum are formed as the currents reassemble large quantities and keep them together as a floating island thanks to the gyres. A gyre is a system of currents that forms a “cycle” movement. In a gyre, the water on the surface is pushed by the wind in “circles”, it turns and turns, keeping whatever floats in it within that same area. 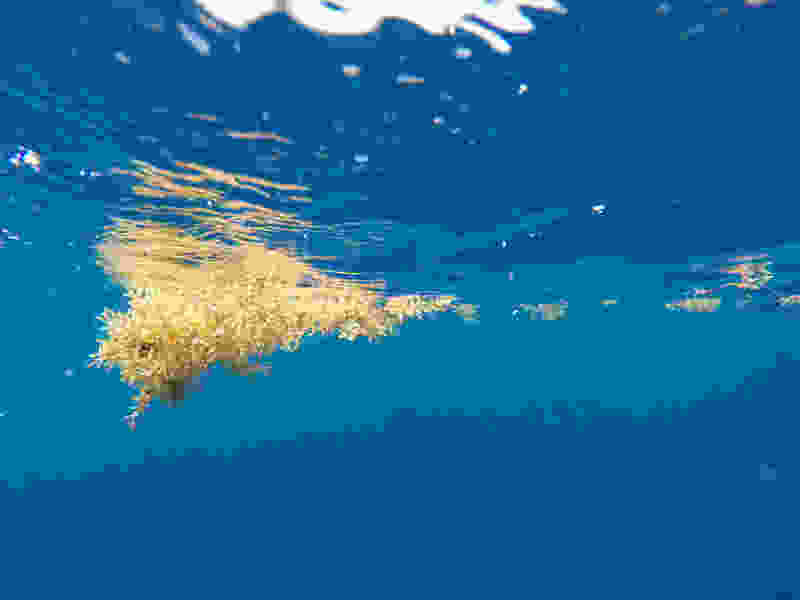 You must have heard of the Sargassum Sea, this place holds large quantities of Sargassum, in normal conditions sargassum stays within the gyre and only occasionally “escapes” the gyre, hence sargassum has been found in the Gulf of Mexico prior to the Sargassum crisis. However, the Sargassum we have found in the Caribbean since 2014 has not been proved to come from that place. More on this further down. Hundreds of species or living organisms can be found within these masses of Sargassum, juvenile fish find shelter, crabs and other crustaceans drift with the Sargassum in the open ocean while they find food and a healthy habitat among these floats. Turtle hatchlings spend a great deal of time swimming with the Sargassum as it represents the only protection they can find during their first years in the ocean and Sargassum provides an ecosystem that guarantees food, shade and a home for many. Sargassum frogfish (Histrio histrio) captured in Playa del Carmen in 2015 by curious beach staff during Sargassum cleanup labors, later safely released. Sargassum has been documented since a really long time. Columbus mentioned it in his discoveries as far back as 1492, when he arrived in the American continent, and many explorers, scientists and researchers have known of its existence for a long time. Sargassum is part of the marine environment and has ecological value, when the quantities that reach our beaches are normal. In recent years, we experienced an unprecedented arrival of Sargassum, this phenomenon reached the entire Caribbean region, the coast of Central and South America and even Africa. The amount that washed up on the white sand beaches was a big shock for everybody: tourists, locals, government, tourism industry, travel industry, scientists, press, etc. Literally, nobody had ever seen anything alike (although we all knew Sargassum, we had never seen this much). The first reaction was to remove it, but rather quickly people realized this was a task for thousands of people. Due to the fragility of the coastal environment, this had to be done by hand. Men and women worked endless hours to remove Sargassum from beaches and seagrass meadows. Only to find that overnight the quantities had increased and there was more to arrive. So, how an alga that is supposed to be good and provide much value for the environment, as described above, can be such a stinky business to deal with from one day to another, and why our feelings are mixed between concerned and overwhelmed? What are the immediate effects of Sargassum? The islands of Sargassum accumulate near the coast where other marine ecosystems thrive, for example: seagrass meadows and coral reefs. It causes a bad smell and releases Hydrogen Sulfide. Big amounts of sargassum can prevent turtles from nesting and can make it very difficult, if not impossible for hatchlings to reach the ocean from the nest. Sargassum can cause beach erosion by altering the structure of the reef lagoons, by suffocating the seagrasses and by creating unbalance in the health of the beach ecosystem. Seagrasses serve in fixing sediment and keeping sand in place, when seagrasses are gone, the sand might erode and the water will rise its level, recently we have experienced unprecedented levels of beach erosion too and it might be linked to the arrival of massive sargassum amounts. Sargassum can be dangerous for our health, respiratory issues have been reported due to the concentration of gases that the decomposing Sargassum provokes. Sargassum blocks the light that normally penetrates the surface, preventing many organisms from completing their photosynthesis process, therefore diminishing the amount of oxygen they produce (yes, the oxygen we breath is produced by seagrass and coral reefs in considerable amounts). Who else is affected by the Sargassum? Many living organisms are affected by the massive arrival of Sargassum. Seagrasses need light to conduct photosynthesis, if big islands of Sargassum cover an extended area of seagrass, these will lack the sunlight and will not be able to produce oxygen which they normally release into the environment during the day, helping other organisms live (including me and you). Seagrasses are plants, during the day they produce oxygen, but during the night they consume oxygen (since there is no sunlight available to produce it), being covered over long periods of time (by a shade like the one Sargassum islands create near the coast) will create a “night” environment where seagrasses only consume the oxygen to live -day or night- therefore altering the natural process of oxygen production. This, together with the bacteria involved in the decomposition of Sargassum will cause the depletion of all oxygen available in the water and the seagrasses will die along other organisms. When an environment lacks of oxygen, it is called apoxic. This is also a very smelly phase and if you’ve been in the Caribbean recently you will remember a stinky smell if you walk near the beach. But, what about the fish? 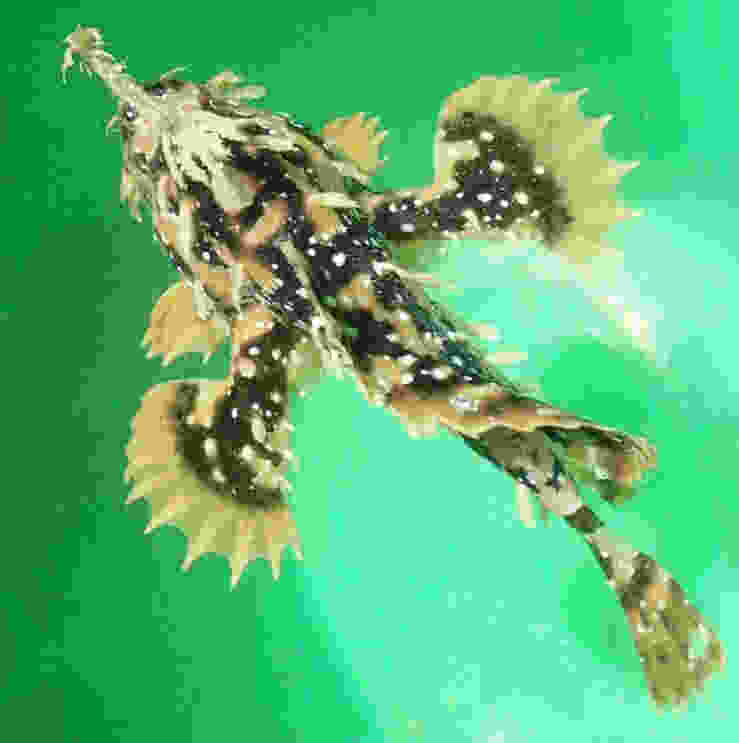 Fish and other marine organisms are able to flee (in most cases). As the environment becomes hypoxic (low oxygen levels) or anoxic (no oxygen at all) animals move to healthier parts of the reef lagoon or the reef. But many organisms, such as seagrasses cannot just pack up and leave. Therefore, they die. Entire seagrass meadows have been swept dead due to the extended presence of Sargassum. But, who can live in a hypoxic environment then? Some algae live in more flexible conditions than seagrass, which is more sensitive to changes in the environment, and therefore can tolerate conditions like the ones the arrival or Sargassum produced, therefore it starts gaining territory in spots where seagrass decays at really fast rates. So, what we would typically see, is that the seagrass, as its health deteriorates, gets “invaded” by the algae which will cover entire areas in a matter of days, and will suffocate the little chance it has to recover. But, wait, why do we care about seagrass? When an excess of nutrients is put in an environment, such as in the seagrass meadows, the growth of the plants is altered. We know that Mexico has a less than optimal residual water management and we know for a fact that part of the residual waters of coastal communities, like Puerto Morelos, ends up in the ocean through filtration and leakages into the phreatic layer (because water in the Yucatan Peninsula is underground due to the porous ground which is mainly limestone). Seagrass meadows are an essential link in the health of the ocean and the coral reef. They provide food, shelter, and a complete habitat for species that spend their life (or at least part of it) next to coral reefs. 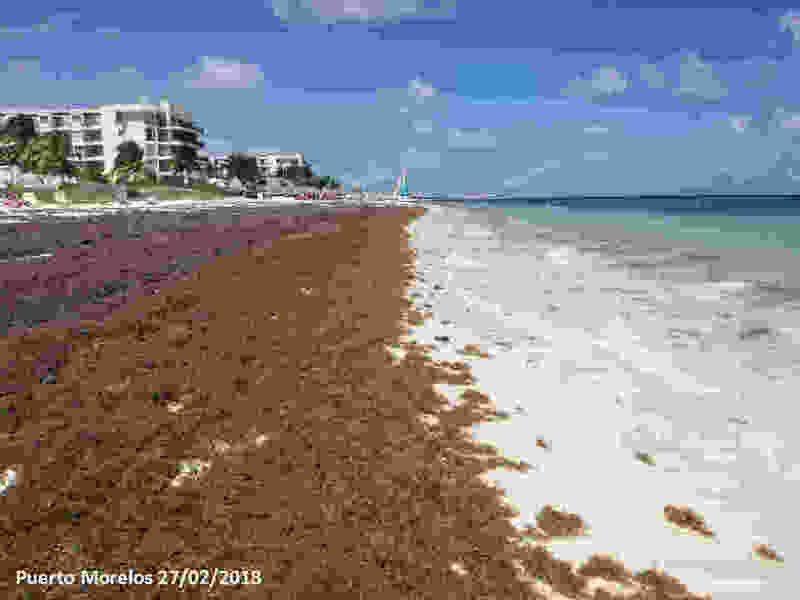 When the Sargassum reaches the coast and accumulates near the beach, it starts decomposing, producing extremely high amounts of nitrogen and phosphor, these two elements are needed for many living organisms to thrive, in controlled amounts. These two elements are considered nutrients. However, the excessive arrival and decomposition of Sargassum increases the levels of nutrients that the living organisms can tolerate. We already know the levels of nitrogen and phosphor are considered high due to the gaps in residual water management, but scientists discovered that the arrival of Sargassum increased that amount even more, creating a crisis in the balance of an already fragile ecosystem. How long does it take to rehabilitate the seagrass meadows and reestablish that balance? In the Mexican Caribbean we might end up with 50 years of damage, if not permanent damage and loss of these incredibly rich and important habitats. As dr. van Tussenbroek says: 4 years after the first massive arrival of Sargassum, we’re still in the beginning of this journey to understand what we can do about it, the problem has just started. 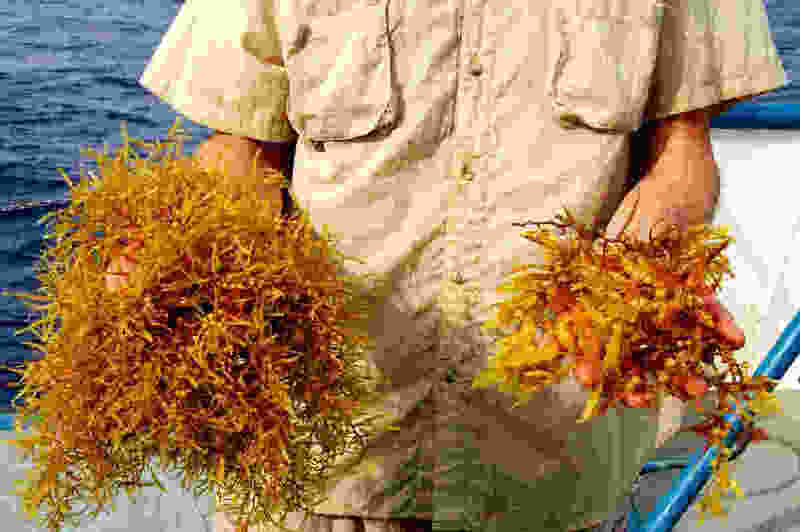 What else do we know about sargassum? 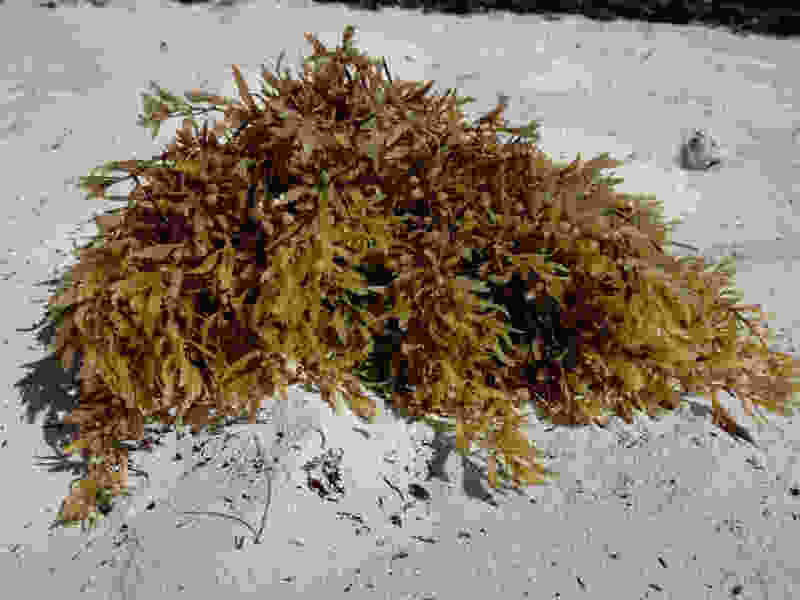 Sargassum can duplicate its biomass in about 18 days. Experiments were conducted where Sargassum was collected in an enclosure and was left floating, two weeks after, its weight accounted for twice of the initial amount. Sargassum in the Caribbean DOES NOT come from the Sargassum sea, the journey of Sargassum has been studied and researched, and tracked back with satellite imaging and other technologies to the coasts of Brasil, where we now have a newly baptized “Small Sargassum Sea”. Sargassum travels north with the currents and is pushed by waves and wind, it enters the Great Caribbean then making its way to our coasts, and eventually, even crossing the Yucatan Channel into the Gulf of Mexico, that’s one long journey! Scientists and government do not have enough data to make an accurate prediction about the future yet, but we know that the increase in Sargassum and other actual environmental issues are produced by the global changes we live in our times, namely global warming. When Sargassum is a healthy environment floating in the column of water it is called Golden Tide, however after the later phenomenon in the Caribbean, it has been granted the less romantic name “Brown tide”. Sargassum DOES NOT become sand, if that was the case we would have solved the beach erosion problem. Sand in the Caribbean is almost exclusively organic, crushed coral, shells and skeletons of other organisms become sand thanks to different processes. 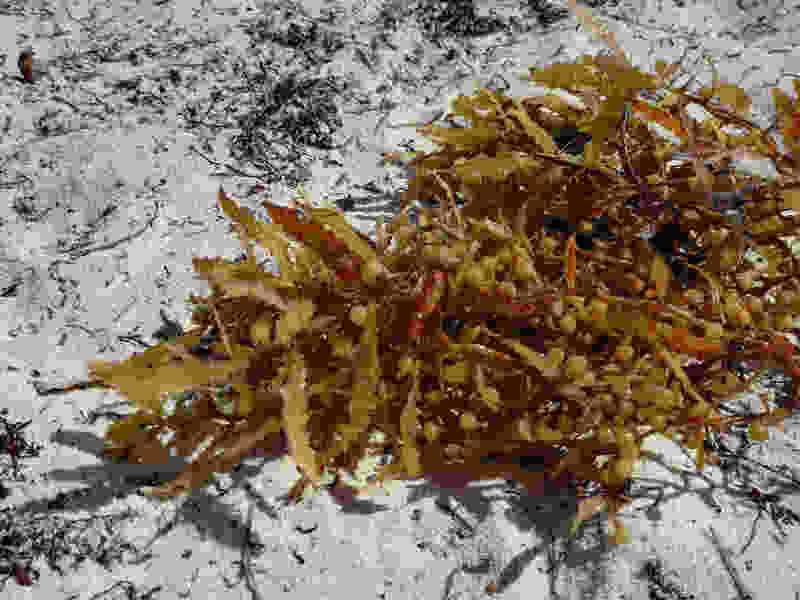 Sargassum does not have a link to the production of sand in the Caribbean. Sargassum does not sting! However, some tiny organisms that live in the Sargassum may provoke a reaction or a rash, this does not come from the alga itself but from its passengers! I hope I have answered some of the questions that you might have had regarding Sargassum. We’ve all had those questions and often we find it hard to get trustworthy information. The national university (UNAM) has a research station for marine sciences in Puerto Morelos since 1981, where they study Sargassum and its effects in our marine environment, especially on seagrass meadows. It was a pleasure to listen to Brigitta van Tussenbroek, one of their senior researchers, who has studied sea grasses since 1990 and to learn about her research and encouragement for government and industry to work towards integrative solutions and more importantly, anticipate and prepare to be resilient about these changes we experience.